Pyramidology: Pyramid Power - Real or Myth? Pyramidology: Pyramid Power – Real or Myth? Millions of people around the world believe that pyramid has power, but who can define its definite power? What kind of power? Who achieved and documented its definite power? None? This means this is not true at all but a scam. All claims about the pyramid power may just be copied from the stories written by others in the magazines or internet to make money out of prototype pyramid structure. What kind of power does pyramid produce if there is at all? Is there anyone who can answer that? Probably, all of them will just tell you that the structure can collect universal energy and sharpen the blade, purify and ionize the water, preserve and change the taste of food, energize the body, plants, heal various sicknesses, and so on. Is this true? Who proved it? Probably, they are just guessing nonsense. So far, there is no definite evidence or scientific explanation at all. Are those written in the books and internet sites made by swindler or fraud business sectors? Here are some of our experimentations conducted in different countries and in various environmental conditions and weather. We did blade sharpening, tested for food rotting and change of taste, mummification of corpse (dead animal), but all these experiments yielded no significant differences between the items inside and outside the pyramid. In regards to the spoilage of foods and food taste, weather condition, place, and the kind of food gives different answers so we concluded this as negative. We even tried Kirlian photography, a photographic process that records the radiation emitted by, or the aura surrounding, an object in a high-frequency electric field. Thus, we believe that this is a fraud just to sell their prototype pyramid model structures. Kirlian photography itself is not true, contrary to what some claim that the Kirlian camera can take picture of energy emitted by some objects. I will explain more about Kirlian photography in our future articles. The "Wisdom of God" and the "Heavenly Fire"
Now Moses was tending the flock of Jethro his father-in-law, the priest of Midian, and he led the flock to the far side of the desert and came to Horeb, the mountain of God. There the angel of the LORD appeared to him in flames of fire from within a bush. Moses saw that though the bush was on fire it did not burn up. So Moses thought, "I will go over and see this strange sight—why the bush does not burn up". Do you believe it? Many of you may not believe in it. Only a countable number of people saw the same or similar occurrences. Some people in Egypt, Peru, Spain, and many Asian countries, especially among God-chosen people, have seen the Heavenly Fire before their eyes. God chooses people and blesses them and give them the "Wisdom of Heaven" according to their knowledge and capabilities with the Heavenly Fire. The Wisdom of God will not reach to those who do not believe or doubt in Him. Most people believe in the wisdom of men, which may decay sooner or later. Well, what is pyramid for? How many of you can answer that? Probably, this is the first time for you to realize what it is. I say to you that it is the place where God stands. It is the most sacred place of God. There are hundreds of pyramids around the world, and we should build more and more to unite with God. Therefore, inside the pyramid, all spiritual maladies you suffer will be eradicated and blessed with the Heavenly Fire—the very same fire Moses saw. According to some studies done by various sectors, there are about 450–650 known pyramids around the world. They are mostly situated in Australia, Belize, Bolivia, Bosnia, China, Tibet, Ecuador, Egypt, El Salvador, France, Germany, Greece, Italy, Japan, Java Indonesia, Peru, Samoa, Spain, Canary Islands, Sudan, Tahiti, and Turkey. 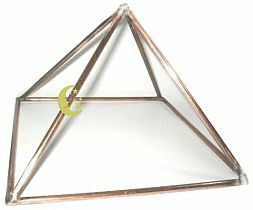 If you are interested in building pyramid effectively for experimental purpose, you need it to be at least 15 feet (or about 4–5 meters) open framed pyramid with four poles attached to each other together at the bottom. What benefit do you get when you are inside the pyramid structure? That's what you should know. Again, the claims that it can collect universal energy and sharpen the blade, purify or ionize the water, preserve foods, energize the body, improve plant growth, and other dramatic effects are all rubbish. These gimmicks are all done by fraudsters. The pyramid structure produces "Heavenly Fire" when it is correctly oriented to the North, and cast out all evil spiritual objects and eradicates spiritual maladies. With said conditions, concentration and meditation and medication will be obtained perfectly without any doubts. 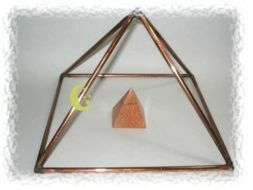 Certainly, this is the first time you hear and understand the truth about pyramid and its work. May God bless you, Amen. The PYRO-ENERGEN is created by its inventor; Mr. Takano is an inspiration of God through His Angels. The PYRO-ENERGEN is an electronics machine that produces the Heavenly Fire, which blesses you and cast out all spiritual and incurable diseases of the world without any side effects.